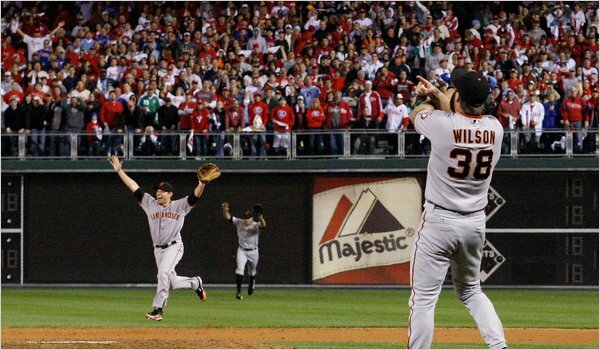 As a California resident and a few hours from SF, I'm so excited that the Giants are going to the World Series. Last time they were there, Hubby was in the hospital. Well, in and out, and back again. Before that, I was driving on the back streets of town in a driver's ed car just as the Loma Prieta Earthquake hit. My parents have been lifelong fans. I like baseball, I do! Never thought I was as competitive as I am until my own kids got into sports and I'm on the sidelines jumping and screaming and stressing. Same thing these last few weeks with the torturous division series, then the league championships. I was on pins and needles watching the games, giving myself a small ulcer. One day I walked the soccer fields back in forth in a small wi-fi area to get the play by play on my iPod. It's been so exciting, local team makes it. I don't have to be a season ticket holder to enjoy a good baseball team. We've been to one whole game this year. Come Wednesday, me like half the country will be rooting for the Giants to win. For the first time as a San Francisco team, they can bring the title to my little pocket of the world. We're considering giving my son a mohawk for the series, it worked for his little league team a few years ago. Hub may grow his beard and dye it black. I can not wash my hair for a week and Hub and I can go as Wilson and Lincecum for Halloween. I never watch baseball on TV until it gets to the championships and the series. And I always pick the under dog to root for. That means I'm very glad the Rangers beat the Yankees, because the Yankees just need to be humbled now and then. Other than that, I'll not rouse and rabble.